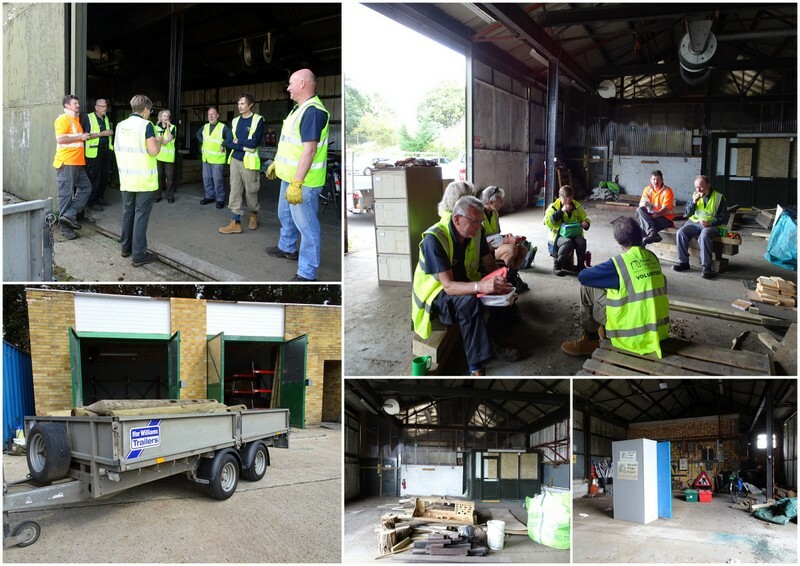 The project has stored all its tools and materials at a City Council site for some years, but the time had come for a move to new premises prior to the site being re-developed for housing. The big container with all the tools had been moved to the new site (just around the corner) a few weeks back and Matt and his crew often had to visit both sites to get tools and materials ready for our work days. The Project’s office, in case you are wondering is at a different location from the store. It is amazing what material the Project had accumulated over the years. Having the luxury of lots of space in a disused maintenance depot it was easy just to pile things wherever because they were never in the way! The new unit is a lot smaller and the move was an opportunity to sort out what was really needed and dispose of everything else. What we are talking about here is: fence posts of various lengths and thicknesses; fencing rails – mostly 3 and 4 metre lengths; wooden and plastic boardwalk planks and posts; gate posts; gates; wellies and waders; safety gear such as helmets, goggles, boots and gloves; fuels and chemicals; wheelbarrows; and about a half dozen other things. All had to be loaded onto trailers and taken to the new “compact” store just around the corner. Thus Thursday 30th and Friday 31st August were very busy days for our volunteers. Matt had borrowed a second trailer, and these were shuttled back and forth between the sites with some of us loading stuff onto the trailers at the old store and others unloading and stacking at the other end. We also shuttled back and forth (less than 10 mins walk between the locations) either to help with the lifting or to get to the brew kit! Things were placed onto the racking in the new store, but it soon became obvious that we were not making best use of this. A plan emerged to use the 4 metre rails as shelving since these comfortably spanned all the brackets and enabled more stuff to be stored. So, things were taken off the racks and the long rails placed to create the shelves. Other stuff was then placed on the shelving in an orderly fashion. Things such as the fuel and chemical storage chests were too heavy to lift and had to be emptied first before four of us hauled the empty chests onto the trailer. The contents were then put back ready for the journey and the procedure reversed at the other end. Brackets were attached to the wall for the ladders as well as a drying rack for our waders. The “new” unit had a leak in the roof which could affect the wood stored there but our ingenious volunteers found a way to deal with this while waiting for a permanent fix. A funnel was made out of plastic sheet, fixed to the ceiling and fed out through an air vent to the outside. We will only know if this works when it rains but it seemed like a good idea. 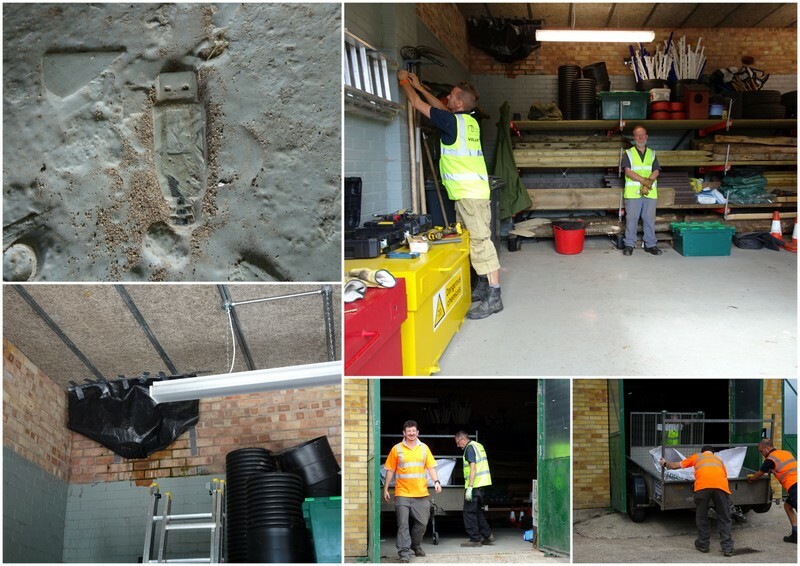 The new site was part of a reclamation yard which partly explains why an old USB cable and SD Card were embedded in the floor! So, two hard days spent lifting and carrying things and working out where to put them but everything useful got moved. A large pile of odds and ends was left at the old site which will be dealt with when that site is demolished. Our photos may show us standing around a lot but that is only because Robert was too busy working to take action shots at other times! A new start for the Project but how long will the store remain neat and tidy?